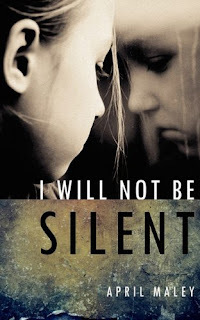 Win an autographed copy of April Maley's book, I Will Not Be Silent! Contest ends June 30th. Please leave a comment on this post to enter. Giveaway ends June 30th... Winner will be announced July 1st! The book does sound really interesting. And something that goes really deep. Michael you are right we forgot to add "email" to the post...lol... I fixed it! Finally found the correct link to here --- there was a double "http" over on Froggarita's group. I don't know if I'm considered an old or new follower... I did do a post on FB the other day about this blog...so I guess I have 6 or 7 points? Ok...I also did a post about it on my personal blog. Hi Kelli just a quickie to say have just grabbed your button (madam) now warm your hands up and grab me back!!! Look just below yours on my blog - cheshire cat pic has all the code for you to drop into an add html link gadget. I assume you would like to be included in the June giveaway too?? This book reminds of David Pelzer's A boy called it, which I was so intrigued by. I can not believe people do such horrible things to their children. Hi I came over because I am about to write a review. But I would love to win your autographed copy so I can give it to a halfway house for girls. I signed up to follow and I will link your post on my review too. Nice to meet you. I love your blog. I am about to build my own review blog. Come by and see me. Thank you for the compliments. The author has a Facebook page called I Will Not Be Silent as well as her own blog called Progress Not Perfection. You can see the link to her blog on my profile. You may want to visit those, she has some great posts.